I went to Starbucks the other day. The place was packed as usual. 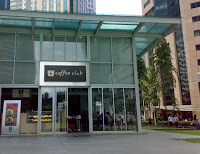 This young cheerful chubby male barista greeted me, with a huge smile and enthusiastic voice. I caught a glimpse of the barista’s name tag. It read “Jesus”. This entry was posted in just that on April 27, 2008 by Eva. Hey, Son, I came across this music video. Sure brings back a lot of memories and emotions, as only you and a selected few have witnessed. This entry was posted in personal, quote on April 27, 2008 by Eva. Every communications person would know the 5W1H principle – the who what where when why and how of telling a story. And to some, there is another important question: so what? Why should the audience care about it? So what was also the question that came to mind when I chatted with a friend a couple of nights ago. A kind man who likes to chat with (extra-ordinary) ordinary people. He likes to sit around the sidewalk to chat with the likes of street hawkers. I do too. It is amazing to hear their stories. They always manage to put me back in my place, to feel thankful but at the same time to feel that I am nothing compared to them. At that night during my conversation with friend, the question just popped out of my mouth: so what? So you like to listen to their stories, so what? What are you going to do about the stories? How are you going to use these stories to help make change, to self and to others? I think that is a question that should ask more often to myself. So I like spiritual discussions. So I like yoga. So I like talking to my stuff animal. So I like writing this blog. So what? How would that make me a better person? How would that benefit others around me? Thanks for the chat. And the reminder. This entry was posted in friend on April 25, 2008 by Eva. Today has been tiring, physically and emotionally. It has been a very long day as well. I woke up at five a.m. after only three hours of sleep. Then off to work. And work. And work. Until about six-seven in the evening. Then I went to a friend’s place (little old ambitious me) until about 12.30 a.m. Dead tired. That is, until I arrived at home at 1 a.m. Then I somehow felt completely refreshed. And started to turn on my computer to write this entry. Earlier today I SMS-ed a friend because I was weighing what I should do tomorrow. Let’s see. I have three religious/spiritual discussion groups that I can choose from. Then I said, there is always an option to stay home. She said: home. She was of course absolutely right. If I need to choose out of all four options, which is the most spiritually relaxing activity? It would be to stay at home. It is amazing what home can do to you. Thank You. As you said, until now, there is no other place on earth that we feel most comfortable in. Well, for us the fortunate ones. There are people who do not have a home. There are people who have big house(s) yet never feel at home. We are indeed the lucky ones. PS: one statement from the discussion in the friend’s house earlier tonight: “Act of kindness is the universal truth.” Beautiful. This entry was posted in friend, personal on April 25, 2008 by Eva. I kept being drawn to this area. Well, “pulled” would be a better word. You kept giving me ‘reasons’ to go there. First, it was the temptation to go to that favorite outdoor shop of mine. I resisted. Then a friend asked if I could buy her a product which rumors have it is sold in that area. I still resisted and bought the product in a different shop in different area instead. At last, You have managed to get me there because another friend insisted for us to meet near that area. Fine, I will go there. And so I went. After my lunch, I went about the neighborhood. Grudgingly. You have got me here, and now what? Unfair. Show me a sign. I went to the outdoor shop and did not see anything that tickled my fancies. Right, I still don’t know what I am here for. Suddenly. 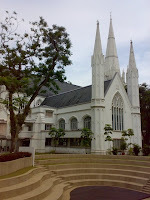 Taa daah.. Singapore’s Saint Andrew’s Cathedral. Wow. Yesterday I asked God to show me a Catholic church. A favorite refuge of mine. Yesterday I did not find any. Then I forgot all about it. I supposed someone still remembers. I have only asked for a simple small catholic church, or even a chapel, for me to sit still in silence. You have given me the cathedral instead. This entry was posted in personal, trip on April 23, 2008 by Eva. This is the second time in a row I have used the word “perfect”. Life must be good. We sat together for the thousandth time. And each time, it was a bliss. A perfect afternoon (the sun was smiling wide and the sky was so blue) in a perfect café (good food, helpful staff, nice crowd) and us sitting by the window overlooking the green square and people passing by around us. We talked a bit about work. We talked more on personal life. We talked families, feelings, and journeys. We talked about our happiness and restlessness. I think there is very little that I would not say to you. I will answer anything that you ask. I tell you all things that you do not. We talked about us being the eternal strong one. The problem solver in love and life. People living a simple life with nothing to hide. A life so simple that there is nothing for us to tell. Not a single complain. Life is simple. Life is good. All is well. We are strong. Until one moment during that conversation, the harsh truth sank in. (Oops, I have just seen you gone online! At this odd hour). We have been just too pride to admit or even to realize. The fortress is so high that even we cannot see what is inside. All is good, all is made of strong stones. Allow yourself to be weak, to be fragile, I said. Or was it you who said it? It is not that important. It does not matter. It is the same. The statement goes both ways. As usual. Because you are my perfect reflection. What I say to you, I say to myself. Your stories are my stories. When I listen to you, I listen to myself, with great joy and sadness. What you feel (or you think you feel) is always something scarily familiar to me. No wonder I never hesitate to tell you stories. From the first time. I am merely talking to myself. There is nothing to be ashamed of. You know. Because somehow you are. I love you as a dear friend. Always have. Always will. Thank you for being such a translucent mirror, a perfect reflection for me. However reluctant we are to admit it occasionally. I had a great stress-relieving time. Thank you. PS: Remember that picture we took together that came out blur? Hmph. Perhaps some things are better kept to self. Or rather, just between you and me. The garbage can for each other. This entry was posted in friend, occasion on April 23, 2008 by Eva. “So how was your trip?” a friend asked. I answered directly, “It was perfect.” Without any doubt or hesitation. Does that sound too positive? Perhaps. Nevertheless, that is how I feel about the trip. I will not talk details here. But just to give you an idea. It was only a short trip. About five days four nights. A one and a half hour flight which I have taken many times. But this time, it feels different. It was the right time. To chill. To get away for a bit. It was the right balance between time alone, time with books, and time with friends. I did not realize how long it has been since I last traveled alone. I did not realize how much I have missed it. It was the right mix of friends. Those whom I hold so dear to me. Those whom I have not seen for quite some time. Those with whom I can be my relaxed and open self. It was the right place to stay. The apartment of an old friend. One of my dearest friends who has watched me—who has allowed me to— grow to be what I am today. I could not have picked a better place to stay for this trip. It was the right activities. Chilling out at the apartment. Chatting with friends. Having lunch, dinner, and coffee. (some work-related deadlines and not-so-work-related emails). Watching cartoon on TV. Getting therapies. Hablando con mis amigas españolas. Learning about the therapy. People-spotting. Doing nothing. Shopping. More chatting. Glaring. Reading books. Oh and walking. That’s a nice one. Long slow strolls. And I am officially in love with Craniosacral Therapy. Thank you, Kheng. Thank you, Martyn. Thank you, Heather. I am back now. Bring it on! ps: remind me to post some pictures here. This entry was posted in friend, trip on April 22, 2008 by Eva.